Confessions of the Chromosomally Enhanced: Did I mention we had a third baby...a year ago? Did I mention we had a third baby...a year ago? Awhile back, a well-meaning blog reader emailed me to inform me that my "About Us" and "FAQ's" were in need of an update. And she was right. These pages were sadly outdated. We're talking years behind. Merryn was a baby and Lydia, well, Lydia didn't exist. Whatsoever. I believe the sender of said email had good intentions and she just wanted to bring this issue to my attention and help me out. What was my response to the email? I laughed. And then I forwarded it to a friend and fellow blogger with 3 kids close in age to mine so she could share in the unintended punchline. You see, it's not that I don't care about this blog or that I'm tired of it. I am still very passionate about and committed to CCE. It's just that I have 3 children. And the most self-sufficient one just turned four. And while Merryn/Mother Hen is extremely helpful, she's busy. I did "A Day in the Life" profile of Merryn on Instagram today and several followers commented on how exhausted they were just reading it. And she only accounts for one third of my daily responsibilities. Flying high, warm sun, cool breeze, big smiles, and enjoyable moments. I give up! I can't do this anymore! You guys are driving me crazy! I need a drink!!!!! Back to that email I received...I started to update the "About Us" tab more than a month ago. And if you click on it now, you'll realize it's not exactly a reflection of a month's worth of work. It's a reflection of an impetuous effort completed in a series of 2 minute increments, interrupted by the clamorous demands of 3 little ones and impeded by the subsequent exhaustion that follows. But, at least Lydia exists now! One of these days/months/years I'll get around to fixing it. But for now, I'm experiencing my "Five Minutes Underwater," and I'm genuinely trying to enjoy it. And because memory storage is A LOT faster and easier on Instagram, you'll find us much more active over there. 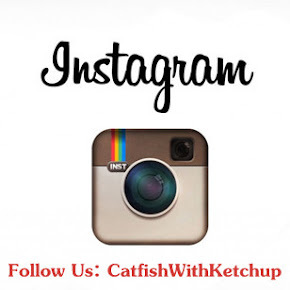 And I do plan on updating the FAQ's one of these days (That means "Frequently Asked Questions," Mom) so if you have a question or if you notice a gap in the information we've provided, leave us a comment or email us at CatfishWithKetchup@gmail.com! LOL I love the picture examples!!! Your Merryn is my son, Tucker! He is go, go, go all day long. He keeps all of us on our toes. I love him tremendously but GOOD GRIEF, he is the reason my house looks like it does. We homeschool, so he is always here and always needing to get into something. Lol I love his passion, but it is tiring. When we had him (our 4th), someone asked me if it was hard to have 4 kids. I replied, "Oh, no. Not at all. #4 just stays in a swing all day!" Ha! Those days sure are passed. They just don't make swings to hold him anymore. I miss your blog posts, but I definitely understand! Always good to get a blog update, but your instagram is a scream! Thanks for the update.